Histopathology of Helicobacter pylori infection in a gastric foveolar pit demonstrated in endoscopic gastric biopsy. Credit: Wikipedia. Most bacteria cannot survive in the acidic environment of the human stomach, but Helicobacter pylori, a major cause of ulcers, thrives under such circumstances. Now research has shown that one of that bacterium's regulatory proteins that helps it adapt to these stressful conditions also regulates the formation of biofilms. Biofilms, a group of bacteria that adhere together on a surface, are often much harder to kill than bacteria in their normal, disaggregated state, and can cause major medical problems. The research is published in the Journal of Bacteriology, a publication of the American Society for Microbiology. "This is the first paper to describe regulation of biofilm formation by H. pylori," said D. Scott Merrell, Ph.D.,study author and Professor of Microbiology and Immunology atthe Uniformed Services University, Bethesda, MD. "We were trying to understand the ability of this microbe to adapt to the stresses it would encounter within the human body," said Merrell. Changing levels of acidity is a particularly major stressor for a stomach-dwelling microbe. 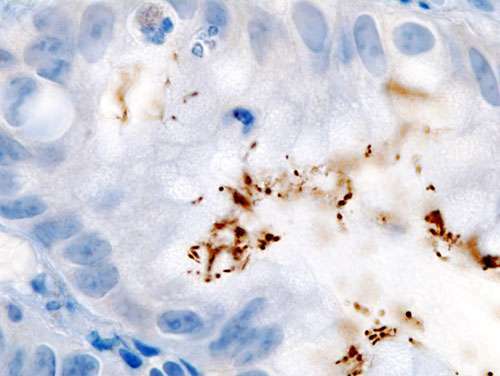 In the study, the investigators created a series of H. pylori strains that contained combinations of mutations that encode three known important regulatory proteins, which they figured would be involved in adaptation to stressors. In particular, two genes, ArsS and ArsR, were thought to work together to sense and respond to acid stress. To the investigators' surprise, strains that lacked a functional ArsS gene formed a thick biofilm-like ring on the growth flask at the liquid-air interface, and formed large clumps of bacteria in the liquid media, said Merrell. Subsequently, the investigators found that the biofilm was forming more quickly and to a greater degree in these ArsS-deficient strains, as compared to other mutants. "Mechanistically, this appears to be due to changes in expression of genes that affect surface adherence and bacterial aggregation," said Merrell. Merrell noted that the investigators had not set out to study biofilm formation. "The results were so striking that we originally assumed that our cultures had become contaminated with something other than H. pylori," said Merrell. "By following up on this observation we found a previously unknown role for an important and well-studied regulatory protein. This has opened up several areas for future investigation." "The research gives us the opportunity to start to explore role of biofilms in H. pylori biology," said Merrell. "It also gives us clues about signals that may affect biofilm formation." These avenues may ultimately lead to better control of this pathogen.